Simon Business School Senior Associate Dean Ron Goettler, Andrew Ainslie, trustee Janice Willett '78S (MBA), Provost Peter Lennie and President Seligman listen to the videotaped remarks of Peter Rossi, distinguished professor professor of marketing, statistics, and economics at UCLA's Anderson School of Management, during Ainslie's formal investiture as dean of the Simon Business School. Rossi was unable to attend the ceremony due to weather. A prepared version of Ainslie’s remarks appears below. Good afternoon everyone. Thank you for attending today. In particular, before I make my remarks, I would like to thank Janice Willett, Mike Ryan, Peter Rossi, our provost Peter Lennie, and our president, Joel Seligman for their participation and support today. Unfortunately Peter Rossi was turned around at Detroit yesterday thanks to the weather, and hence his participation is by video. I would also like to thank Ron Goettler, not only for his hard work getting today organized, but also for being such an excellent Dean of Faculty, Lamar Murphy for all her hard work, and the many other people who helped make today happen. It is an extraordinary honor to have been asked to lead the Simon Business School. 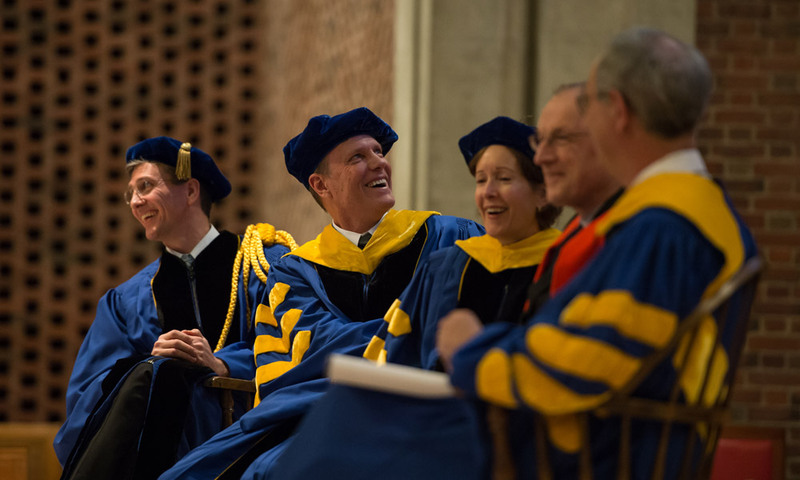 From its very inception, the Simon School has been widely viewed as an intellectual leader. Academics often speak of it in the same sentence as schools that are far better known to a broader public. Two schools that share this reputation for excellence in research are ones where I spent the formative years of my career—the University of Chicago and UCLA. Hence, when I was given the opportunity to lead a school with such an extraordinary record of academic excellence, I jumped at the opportunity. So today I intend to briefly look at his time at Rochester. I have used a combination of documents that were written during his time, his published papers, and the rather large amount of oral history that has come my way, whether I wished for it or not. I will divide my thoughts into Dean Meckling’s leadership style, his papers, his perspective on the purpose and functioning of a business school, and end with lessons that it can teach us as we look to the future, a half century later. Bill Meckling was an extraordinary scholar, even during his time as Dean. The ability for Deans to do this has eroded over time, but this does not lessen his achievement in being both a great leader and a great scholar. Parenthetically, I should point out that this duality is made even more extraordinary by his passion for golf. In a speech given by Dean Charles Plosser after Dean Meckling passed away, he said, “I will never be able to fill his shoes, but I will continue to try. More importantly, I’m still trying to figure out how he was able to leave work every day at noon between June and August to play golf!” But I digress… His most famous paper, co-authored with Michael Jensen, was published in 1976, well into his tenure as Dean. It has been cited over 8,500 times, and continues to inform the way that economists think about organizational behavior, agency theory, and the structure of firms. To this day, it is foundational in the way that we teach organizational structure at the Simon School. Importantly, Dean Meckling believed that what he and his faculty were doing was important to his students. George Stigler once wrote in an essay that economists had little to offer the business world, ending with: “A dominant value of the scholarly world is a certain disengagement from the contemporary scene and a search for knowledge more fundamental and durable than that required for practical and immediate purposes… The scholar is not a handmaiden of either local commerce or of this year’s congress.” To this, Dean Meckling responded bluntly with “I think that’s wrong. Economists have a body of knowledge that business schools haven’t taken advantage of. Economics is a discipline that can help students solve the sort of problems they meet within the firm.” True to his word, he built a curriculum around those findings of economics that informed the major areas of business, and built an extraordinary faculty to help him do it. I have heard the line many times that Dean Meckling held all decision rights. He listened carefully, analyzed the data, and made a decision. The most famous example of this is when, after looking at the output of his organizational behavior group, he decided he was not impressed. I was given a Wall Street Journal article that quoted him as saying, “I spent a lot of time considering the way that they looked at problems. I finally decided it wasn’t going to go anywhere.” So he disbanded the group, and to this day, we do not have an Organizational Behavior group—and our beliefs and teachings remain steadfastly rooted in Economics. I was also given a 15-page memo sent out to the faculty after a subset of his faculty had argued hard for the inclusion of a less theoretic, more practical version of a class called “Business Policy.” In it, he analyzes the arguments given by those faculty members, quotes extensively from the leading textbook on the topic at the time, demonstrates that its arguments are both tautologous and, simultaneously, contradictory, and shuts down any hopes of such a class. It’s a magnificent read! He was a man of principle, and made sure that his school represented that set of principles. His leadership during his time at Rochester also reached outside the school. Probably the best example is the commission to end the draft in the United States where he led the research—a commission, by the way, that Ron Hansen also took part in as a researcher. The commission included several other famous economists, including Milton Friedman, who wrote of it in his book, Two Lucky People, Allen Wallis and Alan Greenspan. Dean Meckling was astonished to find that there was a lot of dissent. He worked hard and persuasively with the commission who agreed with him to change the initial verdict, which was five against the draft, five undecided, and five for, to a unanimous vote (and a convincing report) to end the draft. Finally, Dean Meckling believed passionately in the importance of free markets. Mike Ryan reminded me of this in a recent conversation. It has had a huge influence on our alumni over the years—indeed, Joe Willett spoke passionately about it at my first meeting with him, when I had been here only a few weeks, and the topic came up again at my first meeting with my National Council of Advisors. Reputedly, his time in the Navy during the Second World War left a lasting impression on him as to the enormous waste engendered by large scale bureaucracies, later reinforced by his studies in Economics. I read a paper that he wrote for a conference entitled “American Capitalism at Sunset.” In this essay, he uses stock market performance and the percentage of GDP devoted to government to argue that government was running amok. He ends, typically, with a pretty bold solution—to dissolve Congress! He was definitely not a man for incremental change! In conclusion, Dean Meckling was a man of deep conviction. He believed in a direct and immediate link between the production of scholarly works and the teaching of business. He ran the school almost dictatorially, but listened carefully to all, even those with whom he disagreed. He was blunt, direct, pointedly open, and deeply honest. He was, simply, a class act. Yet I wonder how he would have fared today. Believe me, I say that with no intent to criticize. In reading everything I could about him, I saw no signs of inflexibility in his thoughts, actions, or beliefs. Quite the opposite—one of his richest relationships was with Karl Brunner, whose field of macroeconomics he did not entirely believe in! So I suspect that the changing nature of MBA programs may have changed his views over the years. My personal view is that the connection between business schools and academic output is more complex today than it was 50 years ago. I believe strongly in the value of research, and would not be willing to be Dean at an institution that did not value it. I was attracted to the Simon School specifically because of how successful this school has been at building incredible scholars over the decades. Dean Meckling built an incredible team, many of whom still teach at the school—and that team has in turn attracted stellar younger scholars such as Robert Novy-Marx, Toni Whited, Paul Ellickson, Joanna Wu—and please, before my phone starts ringing, this is an incomplete list; the strength of our faculty is immense. The connection to teaching is a little less direct however. So I find myself somewhere between Stigler’s and Dean Meckling’s position. Economics has become so complex that it takes years to really understand even one sub-field of the vast literatures that it has spun off in areas like Finance, Marketing, Accounting, Operations, and Strategy. However, I hear a consistent refrain from our alumni: that Simon taught them a new way to think. Our economists give them a different lens on business problems that they find valuable for their entire careers. It is this philosophically rich approach to business problems that will continue to enrich our students’ lives even if Novy-Marx’s latest paper leaves them gasping for breath. But as the complexity of our research has put our research further and further out of reach for our current students, it has become increasingly incumbent upon us to ensure that what we put into the curriculum remains relevant to our students. On this too I disagree with Dean Meckling’s strategy, if only because we have moved on since then. In that 15-page memo that I described earlier, he derides any content not directly based on theory. It is hard to imagine a business school today that does not use cases, or classes taught by practitioners. My personal belief, well supported empirically by the number of great schools that have followed this path, is that there is an optimal mix between the value of a purely scientific approach and the impact of practice. We lean more towards the scientific at Simon, and I hope to keep that in place during my tenure, but a pure approach where only practice or only economics is taught would do our students a disservice. Recruiters have made the case loud and clear that they want students to arrive with a toolset that incorporates both practical and theoretical insights. I also do not believe in holding all decision rights to myself. Quite the contrary—I believe that unless others are directly involved in their own governance and the path that their institution takes, they are apt to “opt out,” and to become increasingly passive bystanders to a process from which they disassociate themselves. I have a viewpoint on pretty much every topic—no one has ever accused me of being shy to state my beliefs—but by and large, I prefer to convince people of the direction that I believe to be correct, and importantly, over the years I have always been willing to change my own path if convinced by others that I am incorrect. I view my role as one more of guidance than of autocratic control. I also believe that faculty should be given a large amount of autonomy on the content of their classes, and intend to ensure that this happens. Again, this puts me at odds with Dean Meckling, as shown by his 15-page memo on Business Policy. Of course, this is truer of overall philosophy than daily decisions. My management team and I exist primarily to ensure that all the daily decisions are made in a timely way, overseen by a consistent set of goals and objective functions, and with a common understanding of the constraints that we all face in achieving them. My function is not, to borrow from Tennyson, to “mete and dole unequal laws”… and I’d better stop there, for reasons that are obvious to anyone that knows the poem. It is to provide an overarching direction and strategy. But to do this requires a huge amount of interaction with and understanding of an increasingly diverse set of constituents. Our direct constituents are our faculty, our staff, our students, our alumni, and our fellow schools within Rochester. Our enormously important indirect constituent is the diverse set of firms that employ our graduates. Coordinating and balancing the needs of all of them is an increasingly difficult task. To do so requires a clear set of goals. Hence, my personal view on this is to ensure that we clearly understand our objective function. Mine is simple, and I have repeatedly stated it—it is to be recognized broadly as an extraordinary school. This is achieved, whether we like it or not, by ensuring that we are well rated in the major rankings of top business schools. To do this, I believe that we have to ensure that our students do as well as possible in an increasingly difficult corporate market. To do that, we have to bring in the best talent that we can, provide them with the most relevant education that we can, and help them find the best opportunities that we can, under the constraint that we remain financially strong in the process. In so doing, we can never give up our research mission, because to do so will ensure that in the long run, we will have nothing of value to offer our students. We will simply be offering them warmed over retakes on popular textbooks rather than the unique way of thinking that our alumni speak about so highly. This is a simple goal, but difficult to achieve. So let me conclude that the spirit of Dean Meckling lives on in our deep-seated belief in Economics as the guiding principle behind business education. This has never been more relevant than today as firms face incredible troves of empirical data, waiting for the right insights that can only be provided by rigorous, structured analysis. But how we proceed from that shared belief will be a little different under my watch. I ask all of you to not remain passively by the side, but to get fully engaged in this process. We’re in this together, and we will reach our objectives by all both helping to make the right decisions, and living by the decisions that we make. There is no room for standing on the sidelines if we intend to retake the place that we earned during Bill Meckling’s time as Dean. 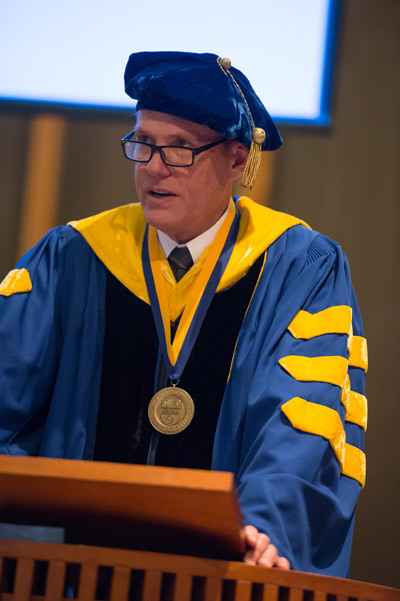 On July 1, 2014, Andrew Ainslie began his tenure as dean of the Simon Business School where he will lead efforts to differentiate and strengthen the School’s curriculum, attract and retain faculty of the highest caliber, improve the student experience, and develop strong relationships with alumni and the business community. After earning his undergraduate degree and MBA from the University of Cape Town and a PhD in marketing and statistics from the University of Chicago Booth School of Business, which he completed in 1998, Ainslie became assistant professor of marketing at Cornell University’s Johnson Graduate School of Management. In 2000, he joined the faculty at the UCLA Anderson School of Management, where in 2005, he was promoted to associate professor of marketing. In 2010, he continued in his teaching role and was named senior associate dean for the Full-time MBA Program, overseeing admissions, student services, and career placement. During his four years in the role, the school increased admissions more than 60 percent and placements more than 20 percent. The school also revised its curriculum to better meet market demands and the needs of the students. During the past year, UCLA Anderson rose from 18th to 11th in the Bloomberg Businessweek rankings. A noted scholar, Ainslie has research interests in economic and statistical models of consumer behavior and direct marketing. His research has focused on new products and movie diffusion, model performance, and consumer behavior uncovered through choice modeling.